Let’s look back on 2018 and examine how funding in the blockchain technology sector compares to previous years. The graphic below shows the total annual blockchain technology funding amounts over time. 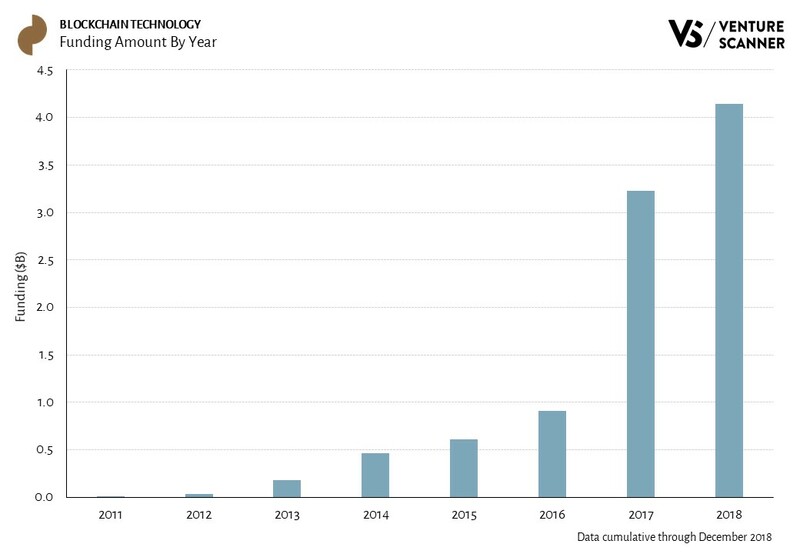 As the graphic demonstrates, 2018 experienced the highest blockchain technology funding on record at $4.1B. It represents a 28% increase from the previous year’s funding. Over the past 5 years, blockchain technology funding showed staggering growth with a CAGR of 87%. To learn more about our complete blockchain technology dynamic report, visit us at www.venturescanner.com or contact us at info@venturescanner.com. Here is our Q4 2018 summary report on the blockchain technology startup sector. The following report includes a sector overview and recent activity. 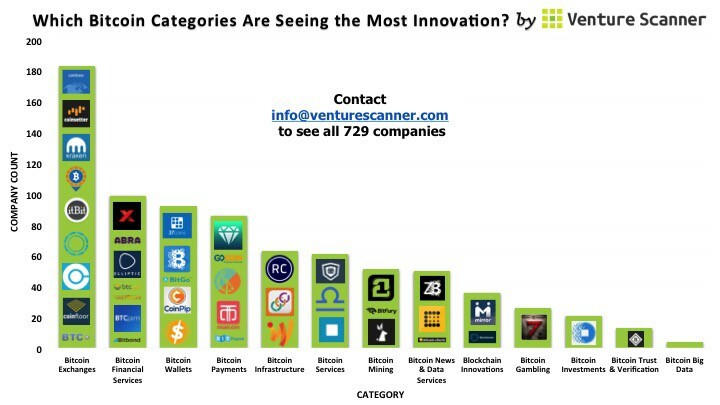 To learn more about our complete Blockchain Technology report and research platform, visit us at www.venturescanner.com or contact info@venturescanner.com. We cover many emerging markets in the startup ecosystem. Previously, we published posts that summarized Financial Technology and the Internet of Things in six visuals. This week, we do the same with Bitcoin. At this time, we are tracking 729 Bitcoin companies across 13 categories, with a combined funding amount of $881 million. 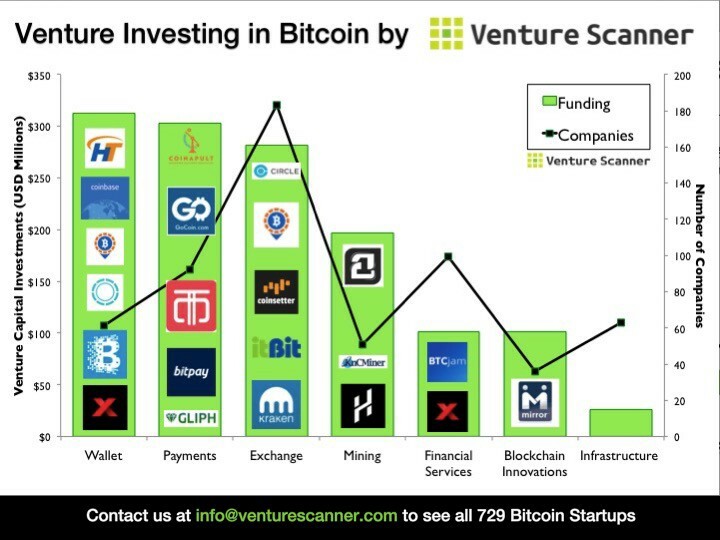 To see the full list of 729 Bitcoin startups, contact us using the form on www.venturescanner.com/bitcoin. Market Overview: Breakdown of Bitcoin startup list into categories. Number of Companies Per Category: Bar graph summarizing the number of companies in each Bitcoin category. Average Funding By Category: Bar graph summarizing average company funding per Bitcoin category. Venture Funding in Bitcoin: Graph comparing total venture funding in Bitcoin to the number of companies in each category. Global Breakdown of Bitcoin: Heat map indicating where Bitcoin companies exist. Median Age of Bitcoin Categories: Bar graph of each Bitcoin category by median age. Bitcoin Wallets: Bitcoin wallets offer consumers a place to securely store their bitcoins, offering their users peace of mind that the public/private keys associated with their bitcoins are being protected. A lot of companies are offering enhanced security features, such as cold storage, multi-step authentication, and even insuring the deposits. Bitcoin Payments: The products needed for merchants and consumers to pay for real-world goods/services using Bitcoin as the medium of exchange. Bitcoin Exchanges: The platforms where consumers can buy or sell Bitcoins into other currencies of their choice. Some of these companies appear to only play matchmaker (tracking bid/ask prices and linking up a seller with a buyer with the spreads close) and others appear to be more like broker/dealers (which, in addition to match making, have their own inventory of Bitcoins they can trade with to make money via speculation). Bitcoin Mining: Includes those who either “sell the pickaxe” or “swing the pickaxe”. The former are typically hardware companies selling the latest ASICs specifically designed for Bitcoin mining. The latter are mostly the conglomerates of rig-operators that have come to dominate so much of the mining activity. Bitcoin Financial Services: Players offering typical banking services, but with a focus on Bitcoins. Example firms in this category offer financial investment advice on how to manage your portfolio of crypto-currencies, focus on providing remittance payments, and provide loans denominated in Bitcoin. Blockchain Innovations: The companies are working on the blockchain distributed ledger technologies, looking to take bitcoin (and other crypto-currencies) beyond currency. Bitcoin Infrastructure: Includes those who are “building a backbone” into the Bitcoin enterprise. This cluster includes the people responsible for maintaining the Bitcoin open-source code itself, offering white-label solutions (such as those for building your own exchange or wallet services), and the physical-world bitcoin Automated Teller Machines (ATM). Bitcoin Trust & Verifications Services: While a lot of bitcoin transactions can be completed pseudonymously, some use cases are governed by regulations where the identity of a person needs to be verified (anti-fraud, anti-terror financing, etc.). If a company offers these regulated services in other currencies, but wants to also accept customers who use Bitcoins, they would turn to players in this cluster to provide 3rd party verification of an identity. Bitcoin Big Data: A core feature of Bitcoin is the public ledger (known as the block chain) which maintains a transparent and complete record of all Bitcoin transactions. Companies in this space parse and analyze that block chain to allow their customers to gain useful insights. Bitcoin Investments: Organizations that have build dedicated funds or investment vehicles to move large amounts of money into bitcoins themselves or into the startups building the bitcoin ecosystem. Bitcoin Services: Bitcoin services include companies that offer typical business services (such as stores, consulting, security, etc. ), but with a bitcoin focus. Examples include recruiting, regulatory compliance, and technical implementation. Bitcoin News and Data Services: Organizations that offer up-to-date pricing information, original content, and aggregated sources of Bitcoin-related news. Bitcoin Gambling: Companies that offer gaming opportunities using bitcoin. The bar graph above summarizes the number of companies in each Bitcoin category to show which are dominating the current market. Currently, the Bitcoin Exchange category is leading the way with a total of 188 companies. 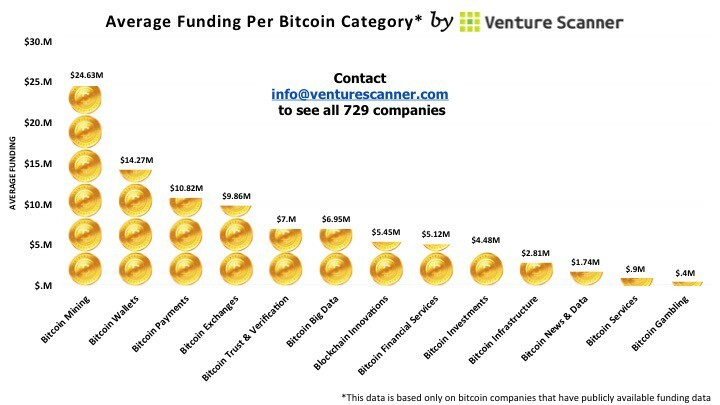 The bar graph above summarizes the average company funding per Bitcoin category. Bitcoin Mining currently has a sizable lead with an average of $24.63 million in funding per company. 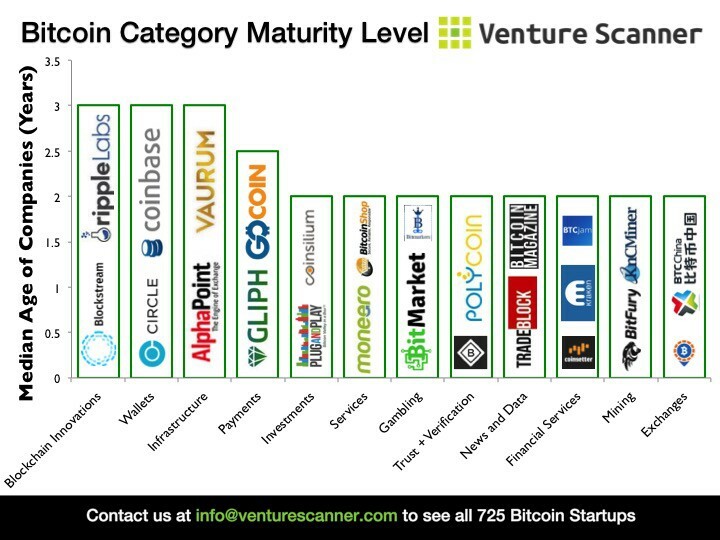 The graph above compares total venture funding in Bitcoin to the number of companies in each category. Wallets, Payments, and Mining seem to be the categories with the most traction. 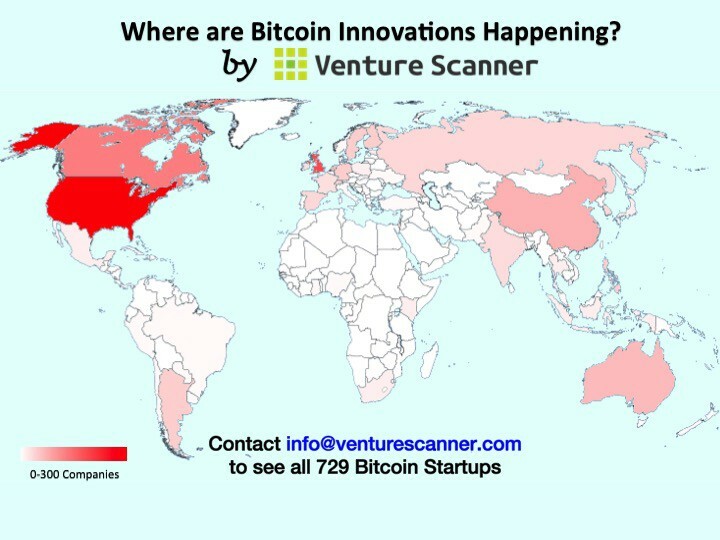 Our updated heat map indicates where Bitcoin startups exist across 68 countries. Currently, the United States is leading the way with 264 companies. The United Kingdom is in second with 42 companies, and Canada is in third with 36. The cities leading the pack are San Francisco with 57 companies, London with 29, and New York with 21. The bar graph above summarizes Bitcoin by median age of category. As Bitcoin is a relatively young industry, there isn’t any one category that is significantly older than the rest. The variation in category medians is between 2 and 3 years. As Bitcoin continues to develop, so too will its moving parts. We hope this post provides some big picture clarity on this booming industry. 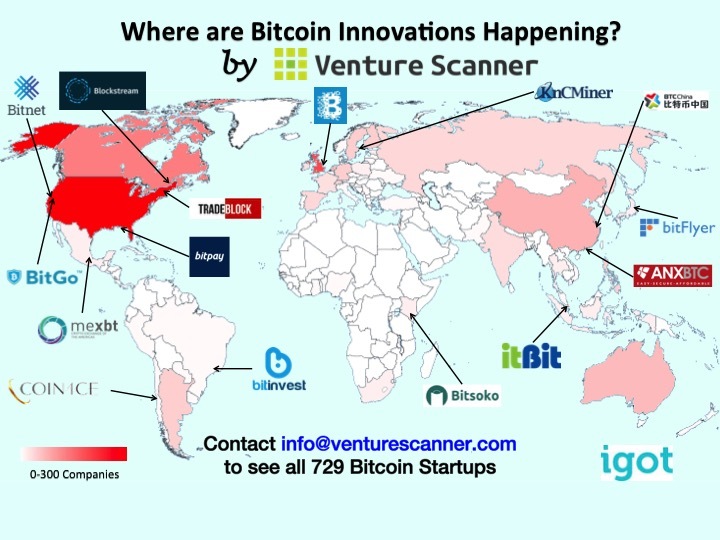 Where Are Bitcoin Innovations Happening? The following infographic is an updated heat map indicating where Bitcoin startups exist across 68 countries along with some key companies in each region. Currently, the United States is leading the way with 264 companies. The United Kingdom is in second with 42 companies, and Canada is in third with 36. We are currently tracking 729 Bitcoin companies in 13 categories, with a total of $881 Million in funding. 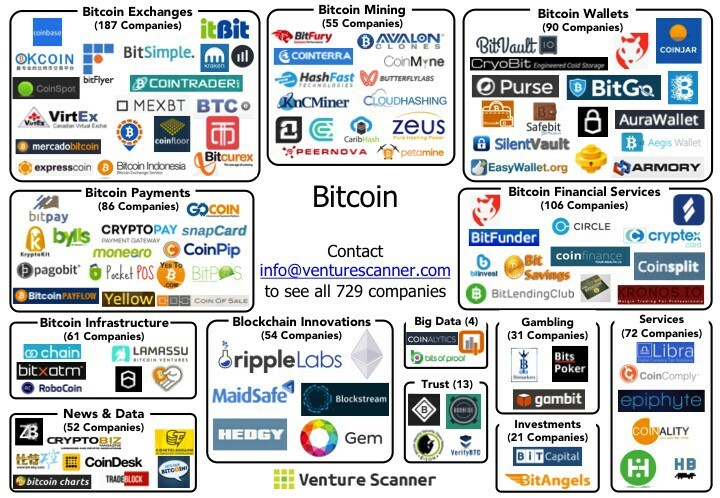 To see the full list of Bitcoin companies, contact us using the form on www.venturescanner.com. Which Bitcoin Category is Most Mature? The following infographic summarizes the Bitcoin sector by median age of each category. Bitcoin is a relatively young sector; the categories with the oldest median age (3 years) are Blockchain Innovations, Wallets, and Infrastructure. Each category in our Bitcoin scan was created by our dedicated team of analysts who specialize in helping you understand the complex startup ecosystem. Venture Scanner enables corporations to research, identify, and connect with the most innovative technologies and companies. We do this through a unique combination of our data, technology, and expert analysts. If you have any questions, reach out toinfo@venturescanner.com.